Cheap Ferries. Cheap Irish Ferry Crossings and Special Offers. Offers are applied automatically when you book. To book a special offer all you need to do is book using the form above. No code is needed. 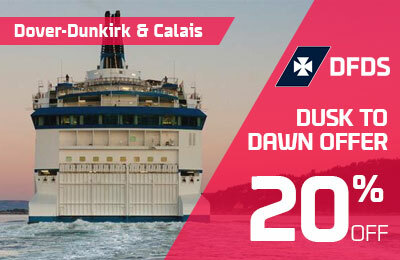 20% off from Dusk to Dawn with DFDS: Dover-Calais & Dunkirk routes. Book by 13th August. Travel all year on selected sailings. 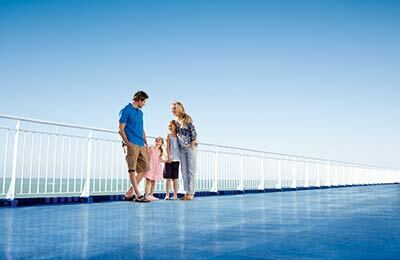 Sail from Dover-Dunkirk or Dover-Calais and vice versa and save 20% compared to regular fares! Take your car and up to 9 people. Prices from £28 each way. This offer is restricted to selected times and days only, often between the hours of 10pm-6am. Travel on this offer is fixed to your booked times only. Hurry sailings fill fast so book early to get this deal. Book by 13th August. Travel until 13th December 2018. 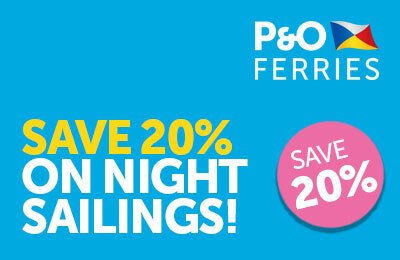 Book a trip of more than 5 days or a single ticket and travel on a night sailing between 10pm and 6am to save 20% on selected late night and early morning crossings between Dover and Calais with P&O Ferries. Simply book before the 13th August 2018 and travel until 13th December 2018. Book by 24th August 2018. Travel by 3rd January 2019. Sail with P&O Ferries on the Cairnryan & Larne route, when you travel between now and 3rd January 2019. Kids Go Free on single and return crossings. Must be booked by 24th August 2018, so hurry, save money and take advantage of this deal before it expires. Great prices from Spain to North Africa! Book by 15th July. Travel all year. 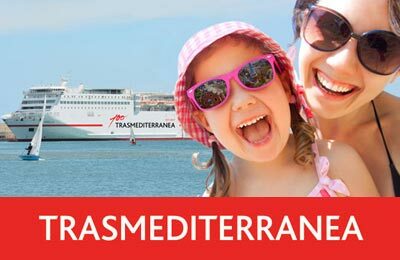 Book your crossing from Spain to North Africa with Trasmediterranea, to enjoy the best rates and travel all year round. Routes include: Algeciras-Ceuta, Algeciras-Tánger, Málaga-Melilla, Almeria-Melilla and Almería-Nador. 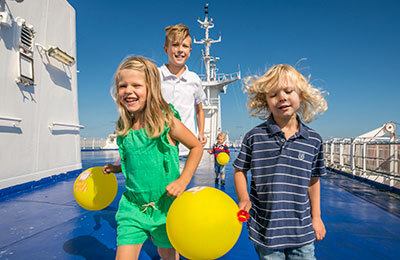 Kids go FREE on Cairnryan - Belfast, Fishguard - Rosslare, Holyhead - Dublin and Liverpool - Belfast routes with Stena Line! Book by 24th August. Travel until 3rd January 2019. Kids go FREE on Economy and Flexi motorist fares all year including Christmas travel. Choose from Cairnryan - Belfast, Fishguard - Rosslare, Holyhead - Dublin and Liverpool - Belfast routes with Stena Line. Must be booked a minimum of 48 hours in advance of travel. Onboard the kids can enjoy the play areas, computer games, kids entertainment, movies and Wi-Fi all FREE! 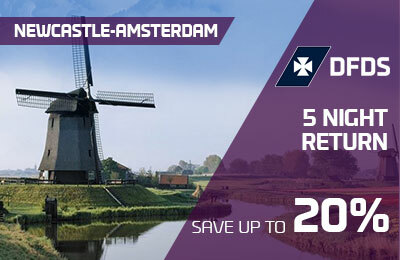 SAVE up to 20% on a 5-Night Newcastle-Amsterdam return crossing! Book now. Travel all year. 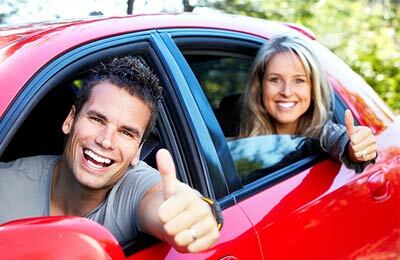 Prices from £68pp for car+ 4 return. Take your car to Holland on the Newcastle to Amsterdam route with DFDS and save up to 20% on regular prices! Book now and return within 5 nights of your original departure. This offer includes, 2 nights onboard in a private, en-suite cabin. Take your car and up to 4 people. Daily, overnight crossings with DFDS and onboard entertainment. Dover-Calais: 3 & 5 Day Short Breaks in 2018! Book by 14th December. Travel until 15th December 2018. 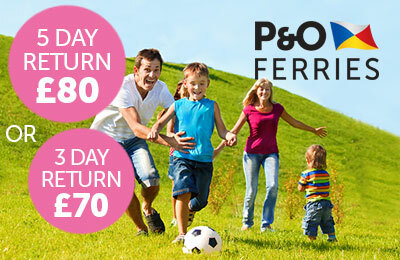 Sail with P&O Ferries. Take your car & up to 9 people. 3-day breaks from just £70 return (Mon-Thur) and £75 return (Fri-Sun). 5-day breaks from just £80 return (Mon-Thurs) and just £85 from (Fri-Sun). Dover-France 1, 3 & 5 day trips from £35 return. 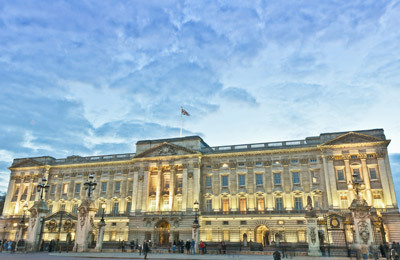 Travel from Dover to Dunkirk or Calais for a short break to France. Save up to 40% compared to regular fares! Take your car & up to 9 people. Day returns from £35, 3-day returns from £65 and 5-day returns from £75. No matter which route you sailed out on, you can return on the other route. 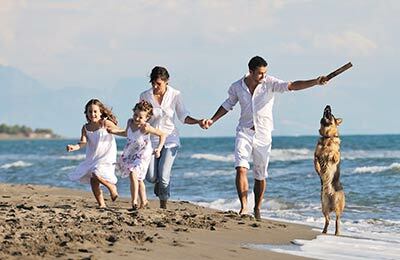 Day trips to France from only £24 per person. Sail with Brittany Ferries. Book now! Travel until 2nd September 2018. Take your car for just £30 extra! Sail from the UK ports of Portsmouth, Poole or Plymouth to the French ports of Caen, Cherbourg, St Malo, Le Havre or Roscoff. 20% off ferries to Greece this summer! 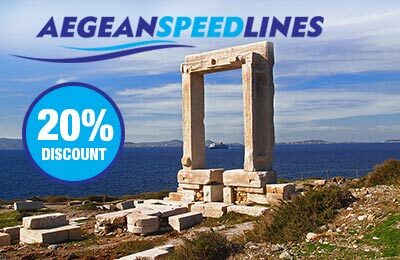 Sail with Aegean Speed Lines. Book 3 months in advance. Sailings are now open for the Greek islands so you can start planning your summer travel. Discount applies to all tickets/fares and for all routes booked 3 months in advance. Book ferries from/to Piraeus, Mykonos, Ios, Paros, Milos, Kimolos, Naxos and more and get 20% off travel in Greece. This offer is automatically applied when booked above on our website. Discounts for car+ 4/5/6 people to Morocco & Tunisia! Book by 30/06/2018. Travel from 01/06/2018 to 30/09/2018. Sail to Morocco & Tunisia on the following routes and save up to 130 Euro! Bookings must include a car and up to 6 people. Valid for onboard accommodation and single & return trips. 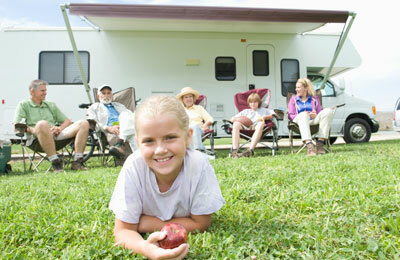 Caravans go FREE to and from Ireland! Sail with Stena Line. Hurry book now before this deal is gone! Selected sailings to and from Belfast. Take your caravan to Holland for free! 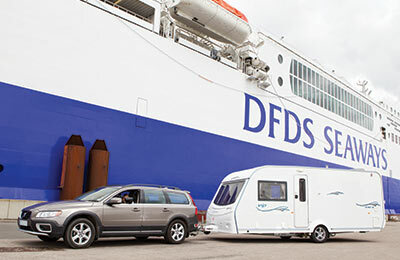 Sail with DFDS. Book 30 days ahead. Travel on selected dates. Book at least 30 days ahead. Click the details button for date restrictions and more information. New bookings only. Subject to availability. Standard terms and conditions apply. Amendment charges may apply and payment charges apply to some card types and PayPal. Offers may be withdrawn at any time without notice.